Staying away from the blog as long as I have, this time, starting to write is that much tougher. I have spent days wondering where to begin, starting posts and abandoning them, and finally, have decided to start afresh this time, taking up a place I visited in May 2011, as part of our summer vacation trip. We began our tour at Mount Abu, and then headed over to Udaipur, spending some wonderful days in the Lake City as well as Chittorgarh. Unlike my usual regular posts, the whole trip has been covered in fits and starts, one post here and another there. 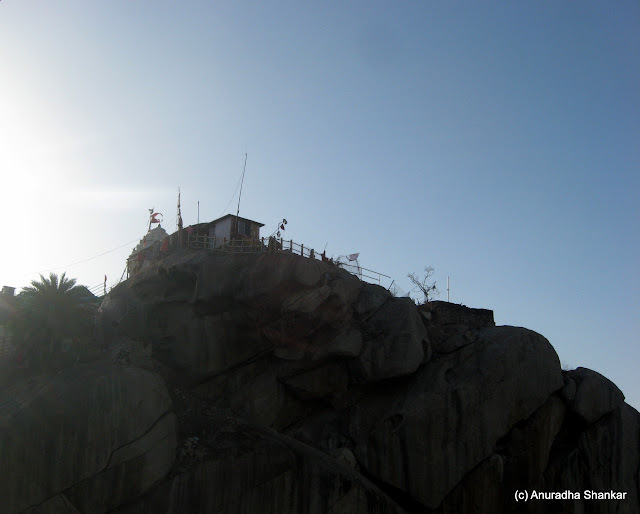 Here is yet another – this time about Ambaji. 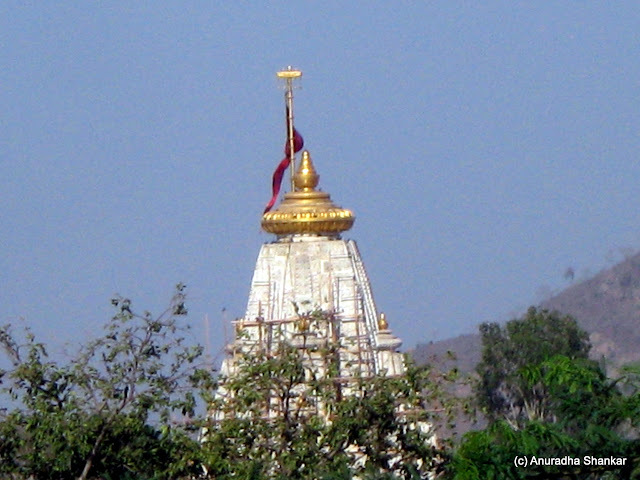 Ambaji is a name for the mother goddess, whose temple gives the town its name. 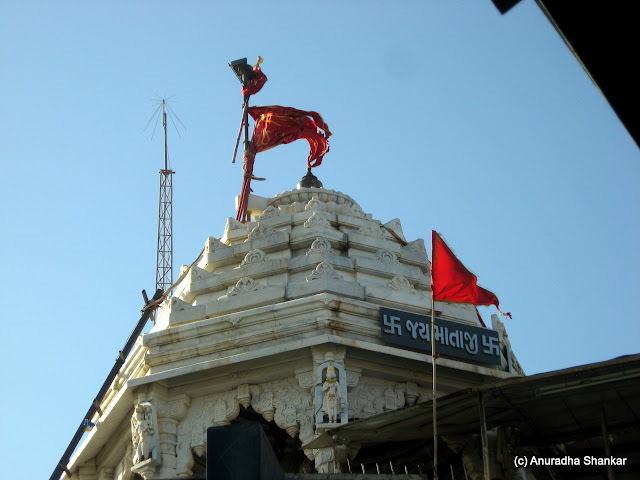 The temple is considered to be one among the 51 Shakti Peethas, (a story I will one day get around to writing), and is located in the Banaskantha district of Gujarat. 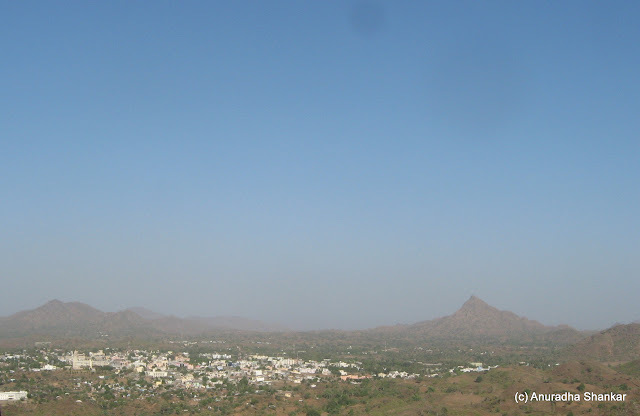 The town is on the border of Gujarat and Rajasthan, about 45 Km from Mount Abu and 20 Km from Abu Road. 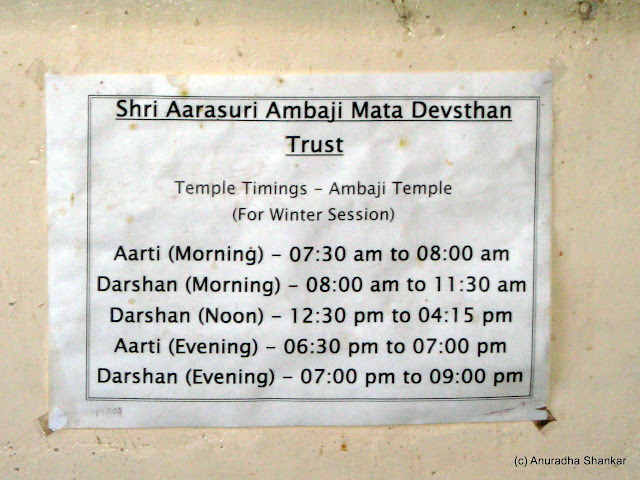 We drove over from Mount Abu and spent a day at Ambaji, staying at the Holiday home run bythe Ambaji Mata Devasthan Trust. The rooms were surprisingly clean and comfortable, considering that these were maintained by the temple, and we spent a day roaming, visiting a number of temples around. 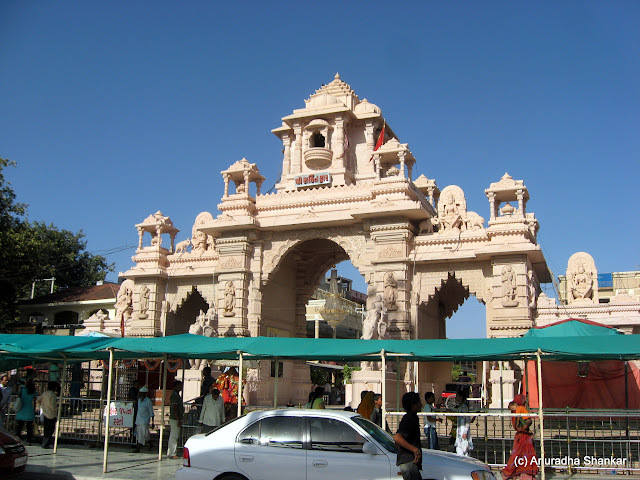 The town is a small one, situated around the temple of Arasuri Ambaji, a name which comes from the hill ranges surrounding the temple – Arasur. These hills are rich in marble, and the stone is very much in evidence wherever you go. From the marble workers making beautiful items for sale, to the workshops specialising in marble shrines, to the temple itself, marble is all around! 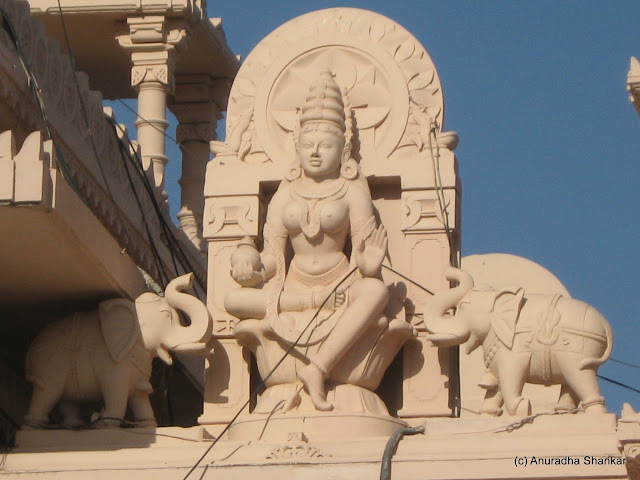 The temple houses in the sanctum, not an image of the goddess, as in other temples, but a yantra or a symbolic form of the goddess. Photography is strictly prohibited, so no photos of the temple, sorry! Being the summer vacation, the temple was packed with devotees. Most were from Gujarat or Rajasthan, but there were many others like us from other states too, and at first sight, the queue was rather intimidating. However, once we entered, we were surprised by the order and peace, in spite of all that crowd! Though there were a few shops outside the temple, the vendors had not troubled us. Inside, we saw shops on both sides of the path, and we overheard another visitor telling his family that these were the shops approved by the temple board for selling puja items as well as souvenirs. It was all well organised and neat, and while the vendors called out to us from their shops, none moved out of their area, or invaded our space in the queues. Such organisation in a temple was a surprise, to say the least!!! For once, it actually made me stray from the line and buy some offerings! The queue was orderly all the way to the sanctum, where men and women were separated into different lines, which is where the usual chaos set in, making me feel more like I was in a normal temple! We had a quick darshan, and rushed out of the crowd, which was still waiting for that one extra glimpse before they were pushed out of the way! Some things never change, no matter how hard you try!! Our main temple visit over, we had time to do some sightseeing. 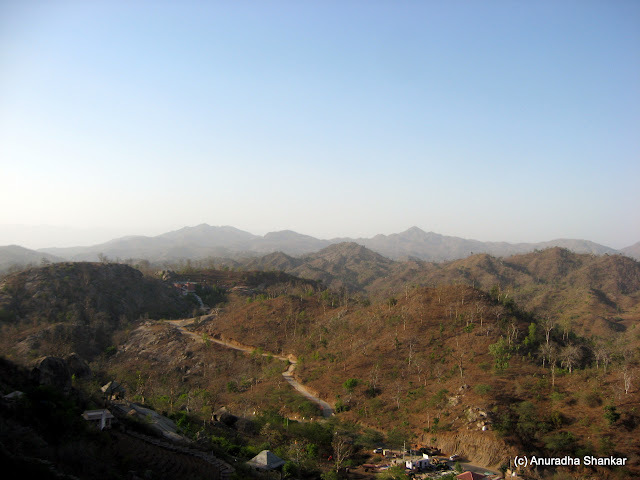 First on the list was Gabbar Hill – a hillock nearby, which is believed to be the original site of the Shakti Peeth, the place where Sati’s heart is believed to have fallen. (Yes, I will get around to writing the whole story soon!) 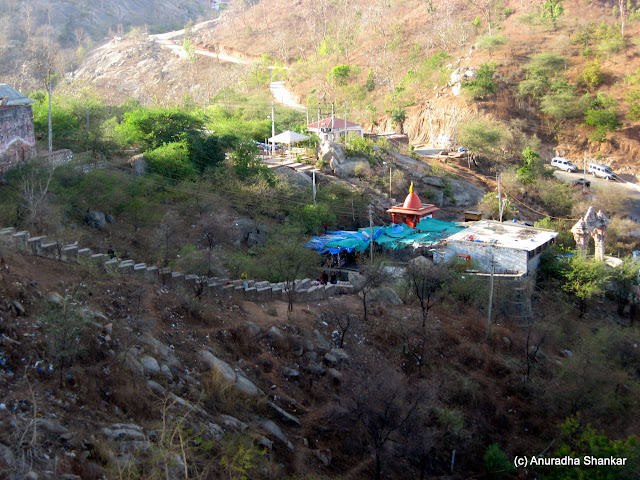 The hill is also associated with Krishna, and it is believed that this was where he was brought for his first mundan – a ceremony where a child’s hair is removed for the first time. Besides this, the hill is also associated with various other legends, and is a much-visited place. 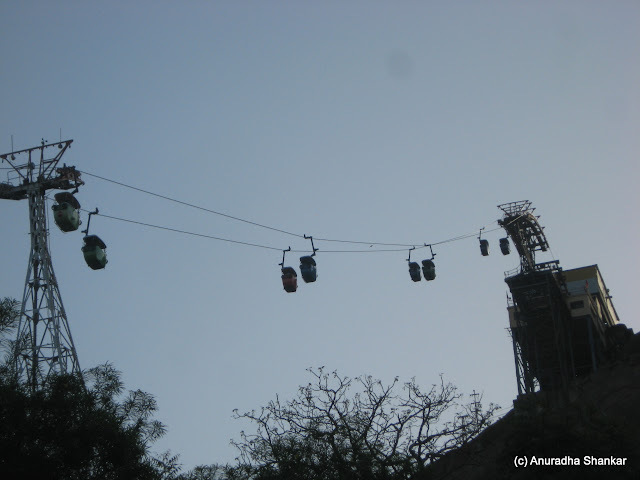 However, the biggest draw here is not the small temple atop the steep hillock, but the ropeway, or cable car, which takes us there! We joined the long queue for the ropeway, and ultimately found ourselves in one of the cable cars. 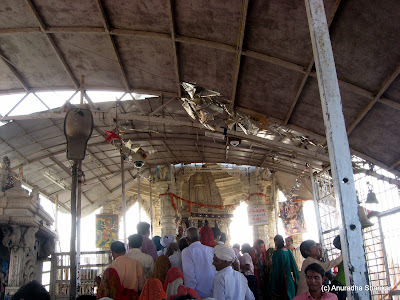 There is also a footpath leading to the temple, and it is not a very difficult climb, apparently, for the devout rarely use the cable car, but the steps, which takes them a little more than an hour. 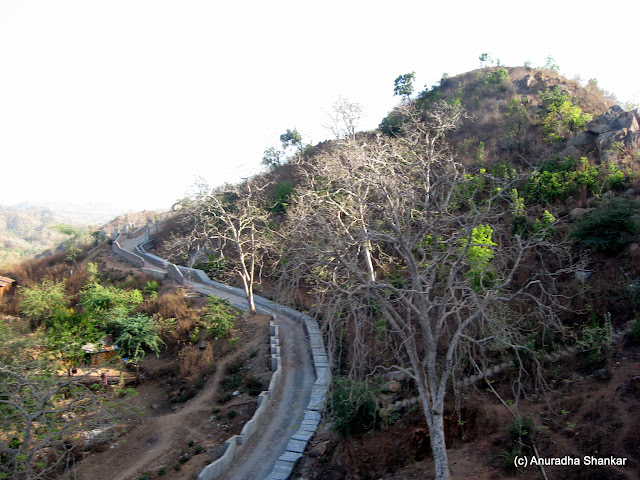 The view from the car was spectacular – though the scorching sun made things a bit too difficult to capture on camera. We reached the top eventually, only to be confronted by a huge crowd, all heading into the tiny temple, which had an eternal flame as a symbol of the goddess. For a while, I wondered if I actually wanted to join the rush, but I had no choice, as the crowd pushed me towards the temple. This was so much more like the usual scene at a temple – my fellow devotees pushing me to get closer to the flame, a couple refusing to move out of the way, and the priest demanding money for keeping the eternal flame burning!! We escaped from the chaos and headed to a small stall for refreshments as we waited for our turn to use the cable car for the way down. The magnificent view was worth all this and more, was what I thought as we made our way down eventually! At the foothills once again, we couldn’t but help notice the enterprise of the ropeway management. While the waiting area for the cable car was a no-frills zone, the landing area was an entertainment park!! Giving in to Samhith’s demand for ice cream, we sat down, only to be pulled in as an audience for a puppet show! It was a challenge to pull him away from the gaming zone, but we spent quite a while in the gardens, where he made the most of the swing, not allowing anyone else to get on!! Then there were the rabbits and love birds, and by the time we got out of the place, it was too late to go anywhere else! We did go to some other temples the next day, but this post is getting too long to include them. Wait for my next post to read about them! 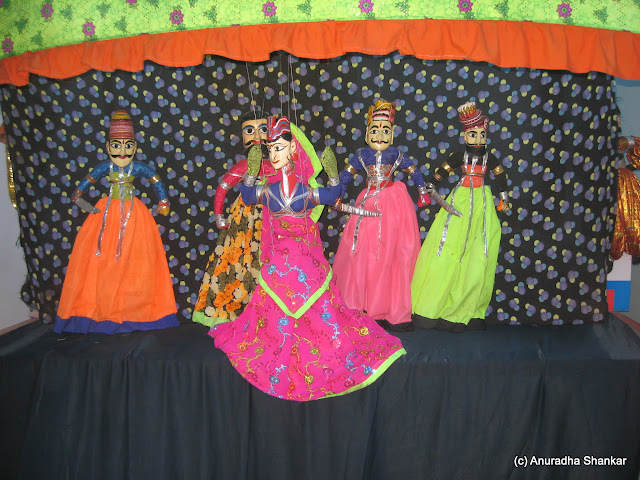 Lovely views from the car and the puppets look so colorful! Beautiful pictures Anu, loved them all. I am not regular these days as we have intermittent power cuts which is hampering all my work. Thanks Chitra, I did hear about the additional power cuts, but so sad to hear that thats why u havent been able to write... hope things improve soon! Thanks! I am sure you would have enjoyed the place!! you should go again sometime..
Beautiful place. This is in my wish list for long time now. Beautiful photos and a lovely temple. Like your blog it's looking nice and awesome with good photos. I always keep in touch with your blog and going to bookmark also. Wow, Anu! The photos are fabulous. And I love the temple architecture. Thanks for sharing them here. I am not sure if I will every get to visit these places, but getting a sense of your trip through your blog. And apologies for having not responded to you earlier. U have been in my thoughts! Will send a message soon! Excellent post & nice click !! I must visit the site you have mentioned. I am greatly interested in temple. Thank you for sharing this with us. This is an exciting place to visit, I think. 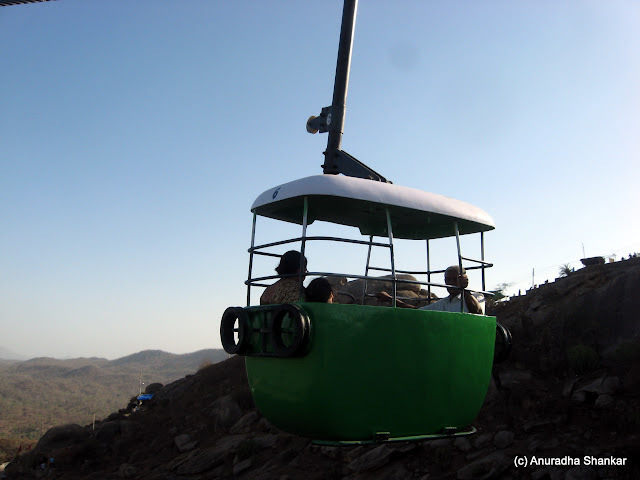 We missed that able car ride when we were in Mt.Abu .The tour guys did not take us there :-(. 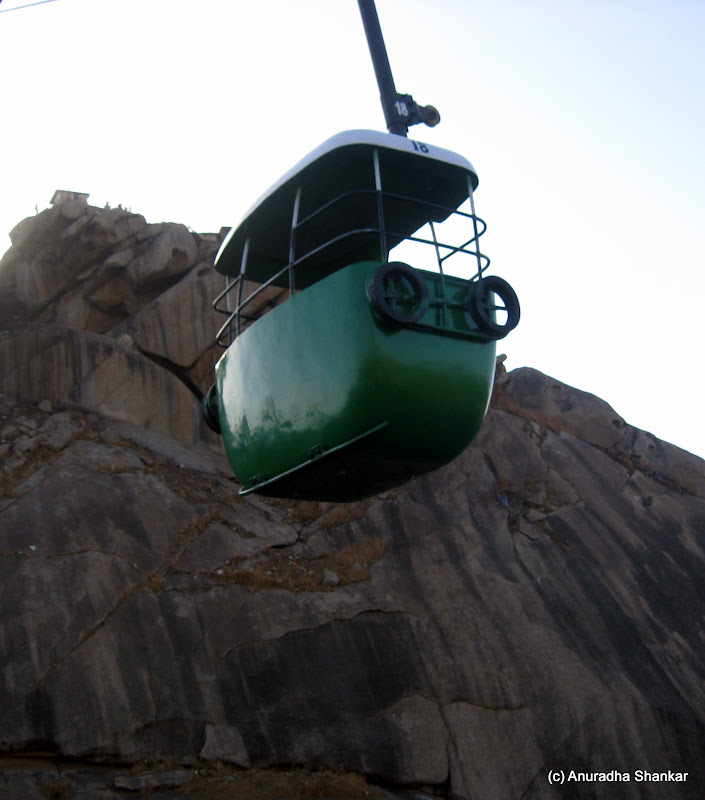 Mt.Abu is a lovely place to visit and easy to visit too. Hi Anuradha, Can you pls share more info about the holiday homes. I plan to stay there for 2 days. Are the rooms decent with geyser and attached bathrooms? Hi Anu, planning a trip next month. Good and pray we would get a nice Darshan. Your post was informative. Glad to hear that, Chitra. Best wishes for your trip. Thank you Savithri. I dont have the contact number of the temple guest house, but if you are going during the week you should not have any issues. Plus there are other hotels as well, though again I dont have any contact numbers right now. best wishes for your trip.